Rewind the clock just over a decade and Honda was once a stalwart of the performance arena. Successive generations of hair-raising Civic Type-Rs often topped the list of best performing hot hatches, the S2000 was a small sports cars capable of providing huge thrills and the NSX was, quite simply, a legend. Things have been decidedly more sedate at the Japanese manufacturer over the last few years though; gone are the super high-revving VTEC engines and the supercar game changers. However, that, in part, looks set to change. The new Civic Type-R is as brutal as a modern hot hatch comes and now Honda is ready to unleash its reimagined NSX – a vehicle that’s been 11 years in the making and manages to pack modern hypercar technology into something that costs as much as an ‘entry-level’ supercar. Before getting out on the roads around Estoril in Portugal, it’s worth taking a little science lesson to explore what makes this thing tick. Underneath the glass rear sits a 3.5-litre, twin-turbo V6 that develops 507hp and 550Nm ft of torque. The angle of the ‘V’ is set at 75 degrees angle, ensuring the engine’s centre of gravity remains as low as possible. Even by modern standards, the potency of the new Honda NSX’s engine would be enough for a sports car of this stature. However, tucked behind the driver and passenger seats is a large battery pack powering three electric motors. Situated right at the heart of the ‘Portuguese Riviera’, the Intercontinental Estoril’s location couldn’t be better. Each room and suite comes with its own private terrace allowing you to bask in the sunshine and enjoy the near-panoramic views over the Atlantic Ocean. The rooms themselves come with a king-size bed and are decorated in an understated fashion with smart stone grey tones that compliment the seafront setting, while there are a number of in-house dining options, including the bright Lobby Lounge or the Atläntico Bar and Restaurant, where Chef Jorge Fernandes brings some of the finest local flavours onto your plate. Checkout is at a pleasingly leisurely 12pm, and driving enthusiasts can store their pride and joy in the 64-space private hotel garage for €10 per day. Two drive the front wheels – dubbed the Twin Motor Unit (TMU) – and a third is connected to the rear axle (labelled the Direct Drive Motor). This extra electrical energy is used in similar way to the Porsche 918 Spyder or the McLaren P1, filling the internal combustion engine’s torque gaps and delivering a total of 581hp for instantaneous acceleration that only this modern breed of electrified sports cars can provide. The system harnesses kinetic energy from the brakes and uses the engine as a generator to top up the batteries a la the Toyota Prius. While you can’t plug the NSX in to charge overnight, it is possible to cruise around town on battery power alone. At least for a few miles, anyway. The electric motors also contribute to the way the NSX handles, with the ability to minutely alter the level of torque delivered to individual wheels in a system called direct yaw control, which theoretically drags the car into a corner and then catapults it out with maximum grip and efficiency. It’s a complex system that goes way beyond most ‘analogue’ sports cars, and one that gets even more interesting when you slip behind the wheel. With the large rotary dial in the centre of the dash (used to control the various driving modes) currently set to ‘Quiet’, prodding the ignition button doesn’t bring the NSX’s engine into life with the typical bark of a V6. Instead, feathering the throttle gently, we’re able to ease away on battery power alone, silently gliding away from our hotel on the Estoril beachfront. It’s not long before we need to call the internal combustion engine into action. Joining the start of the N247, just outside of the nearby town of Cascais, the V6 kicks in as our speed begins to increase. Still in ‘Quiet’ mode, it marks a restrained entrance due to the fact that the exhaust gasses are pumped through baffled pipes, while the suspension is at its most relaxed for maximum comfort. As we enter the southern tip of the Parque Natural de Sintra-Cascais, the N247 hugs the Atlantic coastline, the clifftop road affording an uninterrupted view over rugged landscape. Dragging ourselves away from the side windows, the road – for the moment – doesn’t require too much of a challenge, allowing us to settle into the new Honda NSX’s surprisingly comfortable cabin. The seats are excellent, making it easy to settle behind the wheel, and the buttons and dials are all laid out in an intuitive manner. For a supercar packing so much tech, it’s a fairly un-intimidating place to sit. As our route takes turn further inland at Malveira de Serra, so the N247 suddenly switches into a ribbon of twisting tarmac, allowing us to explore the various different drive modes in a little more depth. Flicking the rotary dial to the right, sets the NSX to ‘Sport’ mode, where the engine comes to life. Flick it again though and you enter ‘Sport+’, letting the real aural delights begin. There’s a 25dB difference in volume between the modes, with the awesome engine note pumped into the cabin via special ‘speakers’ when ‘Sport+’ is selected. Overlooking the coast just above the Praia do Guincho, the Fortaleza do Guincho hotel’s stunning setting is only outdone by the quality of its in-house restaurant (and world-renowned wine cellar, carefully curated from the offerings of international and local vineyards). Awarded its first Michelin star in 2001, the kitchen uses the Atlantic Ocean as its garden, serving up some of the best fish and seafood dishes in the country, all accompanied by plenty of other locally sourced ingredients. A regular award winner, the restaurant’s glass-fronted dining room not only provides a light and open ambiance but also affords guests with stunning views over the surrounding Atlantic Ocean. Prices may be at the upper end of the scale but, as an experience, it’s worth it. With nearly half the country bordered by the Atlantic Ocean, Portugal is one of Europe’s premier surf destinations and, from your base in Estoril, there are a number of prime surf spots all within a few miles. Just to the east, Carcavelos provides a haven for surfers of all abilities, with an expansive beach and a wave that is (like most Atlantic swells) at is best from November to February, although a mellow swell can be found during the warmer summer months. For those looking to be tested, take the trip up the coast to Peniche where you can ride the world famous barrels at Supertubos while, for beginners, the region is well served by surf schools, including the Lisbon Surf Camp. Turning onto the back lanes towards Cabo de Roca, Honda’s new age supercar shows its extra size. The roads, which were previously used for Rally Portugal, begin to feel slightly claustrophobic. Something a little smaller (and a tad nimbler) wouldn’t go amiss on this tortuously snaking tarmac, especially as the NSX is capable of chewing through the road at a blistering pace. Honda is refusing to release official 0-62mph sprint figures but we’d happily wager that the launches float around the three-second mark, while the top speed is around 190mph. The reward – the lighthouse at Cabo de Roca, the most westerly tip of the European continent – is definitely worth a few hairy moments on the old special stages, as once again we’re brought face to face with the might of the Atlantic. While the NSX may not have felt at home on these particular streets (we’ll have to come back in a hot hatch to truly enjoy the roads closer to the cliff), it’s a whole different story back on the N247 towards Sintra. Despite weighing in at nearly 1.8 tonnes, the new NSX is impressively dynamic in the corners, with its hybrid powertrain offering ballistic acceleration out of each bend and the trick direct yaw control doing its best to make even the ham-fisted look good behind the wheel. There’s enough movement at the rear to ensure it remains a challenge when pushed but it inspires confidence and constantly teases us to take corners faster and get on the power earlier. The grip levels are fantastic. Weaving through the national park’s forest, the NSX proves unshakeable and, despite the litany of technological aiding us behind the wheel, the experience feels surprisingly organic. A route this technical needs a car with strong stoppers and, in this respect, Honda hasn’t failed to provide the NSX with some impressive braking capabilities too. Brake-by-wire systems can sometimes feel artificial but the lack of a physical connection between the pedal and each wheel isn’t translated back to our feet. Instead, there’s a brilliant level of control at our disposal, something that helps to calm the nerves when navigating a route littered with some tricky bends. 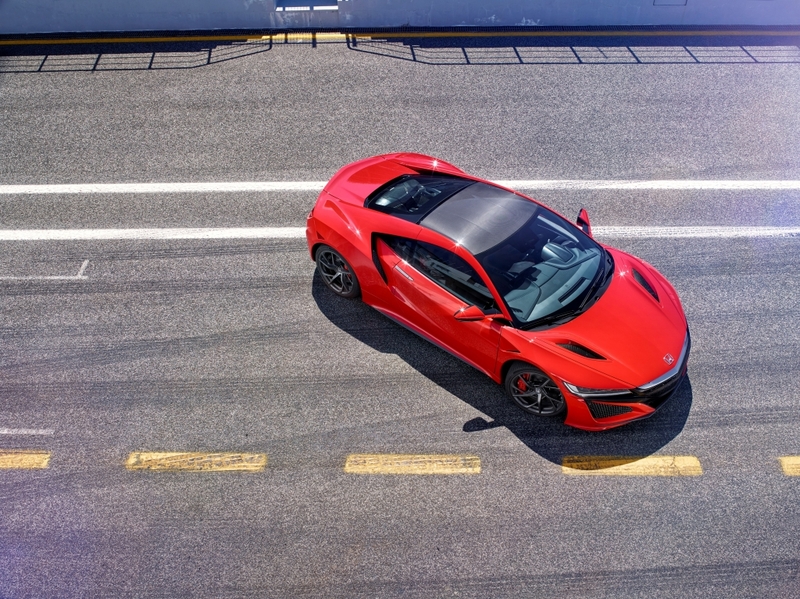 The car’s attitude is at is most raw in ‘Track’ mode, where all 581hp from both the V6 engine and the electric motors is unshackled, the traction control systems are pared right back and we can engage the NSX’s party trick: Launch Control. Many modern performance cars may share the same function but, the acceleration from the new Honda NSX hits you like a body blow from Mike Tyson. It’s not long before we reach Sintra, another worthwhile stop on our tour of the Parque Natural de Sintra-Cascais. The ‘Castle of the Moors’, set on a hilltop overlooking the historic town, is an incredible sight, providing another photobook moment for this breathtaking road trip. At the more leisurely pace afforded as we tour around the town, the car’s footprint feels somewhat neater (making parking a doddle) and the great visibility makes it an ideal everyday proposition. Plus, the selectable modes mean it can settle down and become a comfortable motorway cruiser when the mood takes you. Portugal’s motorways are often deserted, too. Without too much traffic to worry about, we can settle back and let the car eat through the miles back to our base in Estoril. Granted, the V6 does drone on a bit in anything but ‘Quiet’ mode but that’s just a good excuse to slip into ‘Sport+’ every so often and push the car’s limits again. While we haven’t been left wanting too often on today’s demanding loop, it’s unfortunate that there’s no option to alter the modes for personal preference. For example, we’d like to have the exhaust note blaring, the steering at its sharpest but the suspension set to comfort when tackling the bumpier roads of Britain but it’s not possible… yet. Portugal can be bright. Very bright. You already knew that though, so sunglasses are already top of your essential kit list if you’re planning a road trip around Estoril. However, to win some vital style points with the locals, make sure your pair of choice comes from Portuguese manufacturer, Skog. Famed for their sustainable ethos (two trees are planted for every pair of eyewear sold), their range of classic designs never goes out of fashion. Whittled from wood, Skog’s excellent Supertubos are named after the famous surf spot of the same name and features some neat retro styling. Polarized lenses (complete with UVA and UVB protection) help to reduce glare, making them perfect for a road trip in sunny climes. For such a technologically accomplished vehicle, the cabin of the NSX is a bit of a disappointment, too. Hop out of an Audi R8 or Porsche 911 and the Honda looks dated, while its Garmin sat-nav is borderline atrocious. Granted, savings had to be made somewhere and the cheap plastics, fiddly touch screen display and basic switchgear are testament to this point but even the stereo sounds tinny and at £137,950, we’d want a little bit more for our money. A mid-life refresh will undoubtedly introduce Honda’s next generation human machine interface, so for those keen on creature comforts, it could be worth waiting before jumping in. Not that you can buy the new NSX right now. The UK’s first allocation of 60-odd cars has sold out and the next couple of years are pretty much accounted for too, which comes as no surprise because this thing is an engineering masterstroke. Yes, there may be some issues that need resolving in the cabin (and the available storage space is rubbish) but Honda has made a car that offers something very different to this ‘entry-level’ supercar market. Its dynamic prowess reminds us of the Nissan GT-R in the way it has harnessed the latest tech to ensure it goes around any bend as efficiently as possible, while the cutting-edge powertrain and selectable driving modes make it very easy to live with every day. This may not be a true game changer like the original NSX but it’s not far off, and Portugal has provided a more than pleasant playground in which to find this out.